house. They were made last September. So what have we been up to in the last two months? Not too much that is really tangible. But we have had two radiators installed, cleared the chai at the back of the house and removed the old electric water tank and connected up to our new oil boiler. We have also been very busy designing the kitchen, choosing the cupboard design and searching for the right floor tiles, sink, oven and other kitchen hardware. 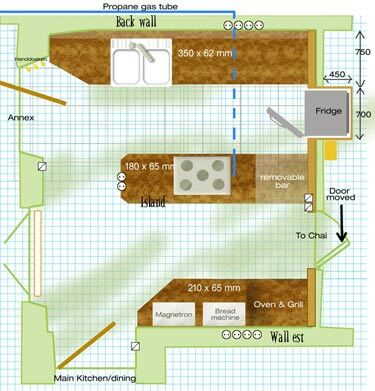 The layout of the kitchen is set. There will be an oven in a central island, the work surfaces will probably be teak and the refridgerator will be sunk into a wall to save space. Our roof will also be attended to this year. One night, at the beginning of March, a severe west wind brought a lot of snow in under the roof and left it to melt through to the ground floor. The next day found us running around with buckets, mops and huge sheets of plastic to catch the snow as it melted. Finally we chose a carpenter to remove and relay the roof and replace the beams at the back of the house. He will also place insulation and waterproofing in at the same time. This will save time and give us more headroom. He is very busy, so we can expect him to start around September. 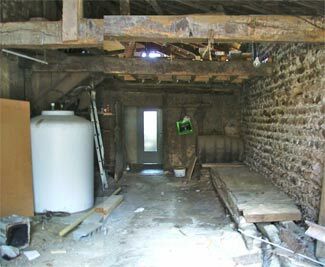 The wine cellar (chai) is now empty, apart from the old oil tank for the heating system. That will be replaced by a newer, safer version that we will install in the big barn. 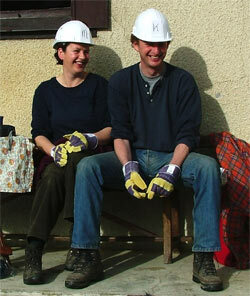 The next job is to dig a 30cm deep trench all along the right wall, across the courtyard, to the barn. This will carry the pipe from the tank to the boiler. Eventually, this will become Perry's studio. 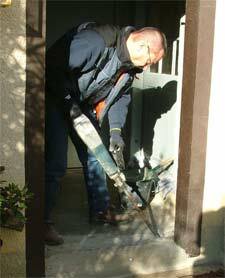 Perry started cutting and drilling off the cement on the outside of the house. The cement keeps the moisture in the walls and forces it inside. That makes it damp in the house and is not good for the earth walls. The idea is to remove the first metre or so from the ground. This will allow the walls to dry out while we wait for the moment that we can get the rest off. 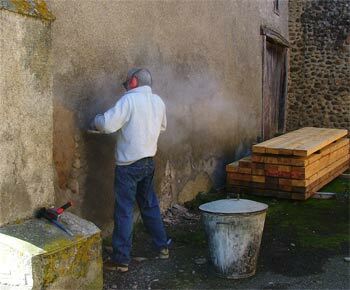 Once the carpenter has finished, the mason can begin. That could be this year, maybe not. We haven't been doing it all alone. Karel and Mirjam, our new friends who were taking a few days out from their house hunting quest, were invited to come help us clear the chai, sort the good wood from the bad and help fill the trailer with all sorts of rubble and rubbish. They did a fine job, which was rewarded by Caroline's culinary delights. Now that the chai is empty, we will use all the oil in the old tank, then bring in a digger to break out the cement parts of the floor and create a deeper foundation for a new floor. Then we will waterproof it, add insulation and finally lay a wooden floor. While all this is going on, we will have an electrician rewiring the house. So there is still a very long way to go. Stick with us for a while longer.